The noninstrument-rated private pilot was conducting a night cross-country flight in the piston-engine-powered, unpressurized airplane. According to the radar track data and ATC transcript, the pilot flew between about 14,000 ft and 18,000 ft for about the last 40 minutes of the flight. Review of weather information indicated that the airplane was likely operating in instrument meteorological conditions for most of the flight, with icing possible below 14,000 ft. About 10 minutes before the accident, the air traffic controller observed the airplane had climbed through 18,000 ft. The air traffic controller subsequently informed the pilot that he would require an instrument flight rules (IFR) clearance to fly at that altitude and asked the pilot if he wanted to file IFR. 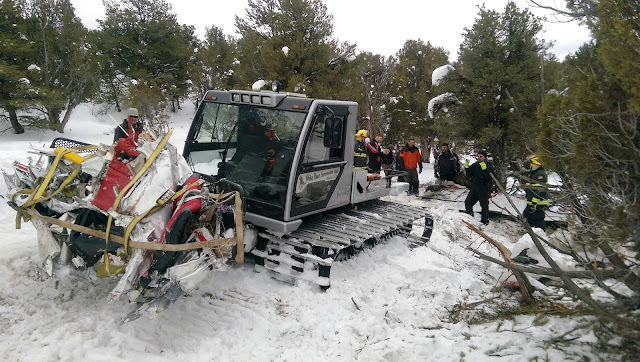 The pilot responded, "that would be great, I just want to get over [this] so I can get back down." The controller also asked the pilot if the airplane was IFR-equipped and -capable, to which the pilot responded that he was IFR-equipped. During subsequent communications with air traffic control, the pilot's communications became inconsistent and the airplane began flying erratically with changes in direction and altitude during the final minutes of flight. The airplane entered a series of descending turns before experiencing an in-flight break-up. Examination of the wreckage revealed no preimpact mechanical malfunctions or anomalies that would have precluded normal operation. Although the airplane was equipped with a home-built system of medical-grade oxygen onboard, the valves on the bottles were found in the off positions; since the valves were inaccessible from the cockpit, was not possible for the pilot to have used oxygen during the flight. As altitude increases, the partial pressure of oxygen in the air decreases, leading to hypoxia. The FAA Aeronautical Information Manual (AIM) notes that hypoxia is a "state of oxygen deficiency in the body sufficient to impair functions of the brain," and "the effects of hypoxia are usually quite difficult to recognize, especially when they occur gradually." The AIM also states that between 12,000 and 15,000 ft "judgment, memory, alertness, coordination and ability to make calculations are impaired, and headache, drowsiness, dizziness and either a sense of well-being (euphoria) or belligerence occur." It also states "pilot performance can seriously deteriorate within 15 minutes at 15,000 ft. FAA regulations (14 CFR 91.211) require a pilot to use supplemental oxygen when operating above 12,500 ft in excess of 30 minutes and during the entire flight time when operating above FL140. The pilot's inconsistent communications and erratic flight track was characteristic of a state of hypoxia, and hypoxia likely resulted in the pilot's inability to maintain control of the airplane. Toxicological testing of the pilot revealed the presence of multiple central nervous depressants and a total of 6 psychoactive substances in his system (diazepam, nordiazepam, hydrocodone, dihydrocodeine, norcyclobenzaprine, and zolpidem). While there is no direct conversion between the liver and kidney levels and blood or serum levels of these drugs, the presences of even lesser amounts of all 6 substances in combination strongly suggests the pilot was influenced by the effects of the multiple medications he was using. It is likely that the combined effects of the 6 impairing substances he was using contributed to his unsafe decision making, which led to him to initiate the flight in the dark, over mountainous terrain, in instrument meteorological conditions, and without ensuring ready access to his oxygen system. The non-instrument-rated pilot's decision to fly the airplane in instrument meteorological conditions at high altitude for greater than 30 minutes without the use of supplemental oxygen which resulted in hypoxia, and a subsequent loss of control. 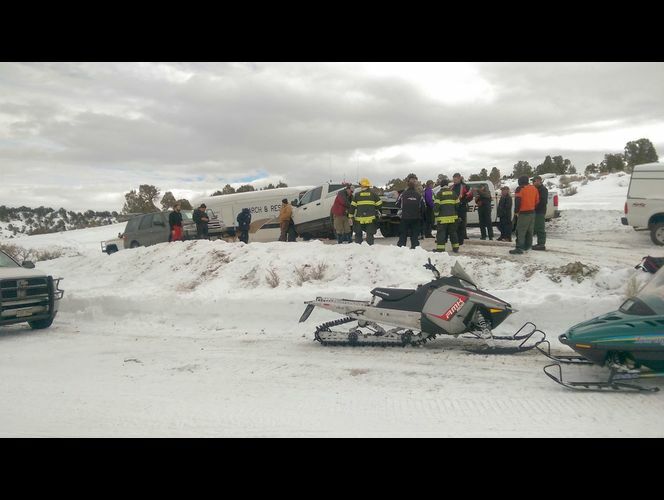 Contributing to the accident was the pilot's use of multiple impairing medications. 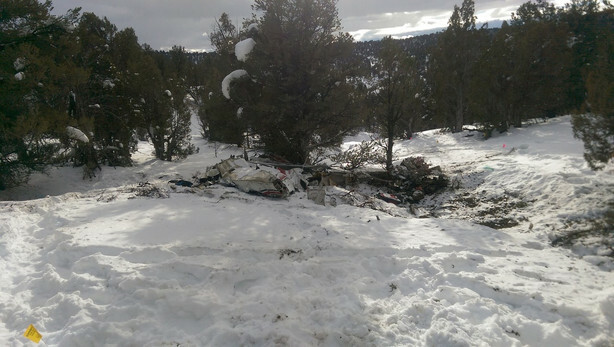 On January 14, 2016 about 1745 mountain standard time (MST), a Beech C-35 single-engine airplane, N2025D, was destroyed when it impacted terrain near Meeker, Colorado. The private pilot was fatally injured. The airplane was privately owned and operated by the pilot under the provisions of Title 14 Code of Federal Regulations Part 91. Instrument meteorological conditions prevailed, and no flight plan was filed for the personal flight, which departed Provo Municipal Airport (PVU), Provo, Utah, about 1620, with an intended destination of Granby-Grand County Airport (GNB), Granby, Colorado. Radar data indicated that, after departure, the airplane circled and climbed to an altitude about 12,000 ft mean sea level (msl) in the general area of PVU before turning east toward mountainous terrain. [Note: All radar and/or air traffic control data is reference in ft msl in this report.] The airplane continued to climb as it traveled east, reaching about 14,500 ft about 1641. The airplane maintained between about 14,000 ft and 14,500 ft until about 1653, when it descended to just below 13,000 ft. The pilot contacted air traffic control at 1704, traveling east-southeast, and was issued the current altimeter setting. The airplane continued in the same direction after initial check-in and began a climb again, the airplane had climbed above 18,000 ft by about 1736. At 1736, the controller confirmed the airplane's altitude, advised the pilot he would require an instrument flight rules (IFR) clearance to fly above 18,000 ft, and asked the pilot if he wanted to file IFR. The pilot responded, "that would be great, I just want to get over (unintelligible) so I can get back down." The controller then asked if the airplane was IFR -equipped and -capable, to which the pilot responded that he was IFR-equipped. The controller subsequently cleared the flight direct to GNB and issued a block altitude between 17,000 ft and 19,000 ft.
Just after the pilot received the block altitude, the accident airplane stopped climbing about 18,400 ft; the controller subsequently asked the pilot if he could maintain 19,000 ft. The pilot responded that he was in the clouds, and the controller again asked if he could maintain 19,000 ft; the pilot responded, "we're getting there." The controller then instructed the pilot to maintain 19,000 ft.
Radar data indicated that, after reaching about 18,700 ft, the airplane abruptly descended to about 17,400 ft, turned to the north, and climbed back up to about 18,500 ft. The controller advised the pilot he observed him turning north asked the pilot if he was okay, to which the pilot responded, "a little bit." Radar data indicated that the accident airplane then turned to the west, descending more rapidly as the airplane entered a right spiral. At the onset of this change in direction and descent, the controller advised the pilot that he observed him in a turn and descending and asked if he was in control, to which the pilot responded, "uh yes." The controller then advised the accident pilot not to descend lower than 11,000 ft and cleared him to descend and maintain 11,000 ft. The controller advised "that's lowest I can get you." The pilot responded "alright (unintelligible) clear there." The controller advised he did not have any [weather] reports for that area and asked if he was planning to head back to the west, to which the pilot responded, "I'm at seventeen now". The controller then advised the pilot he observed him doing some "S turns" and asked if he was proceeding to Grandby or heading back to the west. There was no response from the pilot. After two more attempts by the controller to reach the pilot, the pilot responded, "I hear you fine (unintelligible)." About 1744, the controller advised the accident pilot that Meeker airport was at his 3 o'clock and 17 miles, and there was an unintelligible response. There were no further recorded transmissions from the accident pilot. The last radar target correlated with the accident aircraft was at 1743:33 and about 14,100 ft; however, OpsVue track data continued to record, showing the airplane in a continued descent until 1744:13 and about 10,300 ft before track data terminated. OpsVue is a commercially available web-based flight tracking program. The track is derived from a combination of several surveillance sources that are combined and a "mosaic" type of flight track is produced. The pilot, age 62, held a private pilot certificate with a rating for airplane single-engine land. The pilot did not have an instrument rating. No pilot logbooks were available for review. On his most recent Federal Aviation Administration (FAA) third-class medical certificate application, dated November 6, 2015, the pilot reported about 600 total hours of flight experience, with 20 hours in the previous six months. The medical certificate was issued with a limitation that he: must have available glasses for near vision. Review of preaccident photographs of the airplane showed the airplane was equipped with a homebuilt oxygen system consisting of two oxygen tanks, two vinyl oxygen masks, and the associated vinyl oxygen supply tubing. The two oxygen tanks were attached to the fuselage wall behind the bulkhead on the left side of the airplane. The oxygen supply tubing attached to each tank and ran forward toward the cockpit area. The valves on the tanks were not able to be accessed to start or stop the flow of oxygen from the cockpit. The airplane model has a service ceiling of 18,500 feet MSL. Although the pilot checked weather information prior to flight with Lockheed Martin Flight Service (LMFS), the data and weather information discussed was not able to be retrieved for this investigation. There was no indication that the pilot received any additional weather briefing information before the flight. 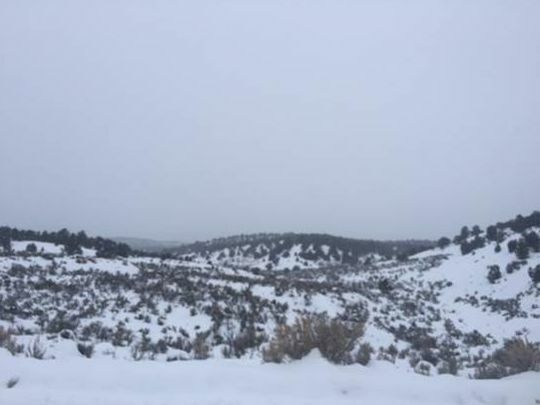 At the time and location of the accident, AIRMETs were active for IFR conditions, mountain obscuration, moderate icing below 12,000 ft, and moderate icing between the freezing level and 17,000 ft. 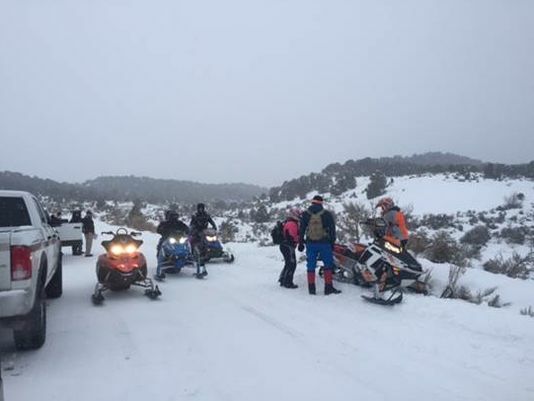 The Area Forecast valid at the time of the accident predicted an overcast ceiling at 10,000 ft with layered clouds to 25,000 ft. Visibility of 3 miles, mist, and light snow were forecast through 1700 with visibility increasing to 5 miles with mist after 1700. Meeker Coulter Field Airport (EEO), Meeker, Colorado, was located about 18 miles east of the accident site, at an elevation of 6,415 ft. The 1653 observation included calm wind, 9 miles visibility, light snow, an overcast ceiling at 3,900 ft agl, temperature -2°C, dew point of -8°C, and an altimeter setting of 29.89 inches of mercury. Remarks included: station with a precipitation discriminator, snow began at 1648, sea level pressure 1018.0 hPa, 1-hour precipitation trace, 6-hour precipitation trace, temperature -2.2°C, dew point -7.8°C, 6-hour maximum temperature of -0.6°C, 6-hour minimum temperature of -6.7°C, and 3-hour pressure increase of 1.0 hPa. The 1753 observation included calm wind, 10 miles visibility, an overcast ceiling at 4,300 ft agl, temperature -2°C, dew point temperature -7°C, and an altimeter setting of 29.89 inches of mercury. Remarks included: station with a precipitation discriminator, snow ended at 1658, sea level pressure 1017.1 hPa, 1-hour precipitation trace, temperature -2.2°C, dew point temperature -6.7°C. A North American Mesoscale (NAM) model sounding was created for the accident site for 1700. The sounding indicated a relatively moist vertical environment from 9,000 ft through 15,000 ft. This environment would have been conducive to cloud formation between 9,000 ft and 15,000 ft. The cloud tops likely extended higher, up to 19,000 ft according to satellite imagery and weather radar data. Icing (clear, rime, and mixed) was indicated between 9,000 ft and 14,000 ft. The 1700 MST NAM sounding was also close to saturation between -8°C and -15°C (between 9,000 and 14,000 ft) which is considered a temperature range supportive of the growth of super cooled liquid water droplets. A more detailed description of the weather in the area of the accident site is available in the Meteorology - Group Chairman's Weather Study Report in the public docket. The airplane was located in tree- and sagebrush-covered, mountainous terrain about 19.5 miles west of Meeker, Colorado. The terrain elevation in the area varied from 6,200 to 6,400 ft msl. The main wreckage included the fuselage, left wing, engine, and propeller hub. The remaining wreckage was scattered over an area about 0.3 mile north-south by 0.4 mile east-west and was distributed in a manner consistent with an in-flight breakup. The wreckage was examined during recovery and later at a secure storage facility. Control continuity was established from the control yokes through the fuselage to the aft side of the center section rear spar. The right aileron cables fractured from the bell-crank in the right wing and the left aileron cables were cut during recovery. The ruddervator control and autopilot cables remained attached to the ruddervator differential mechanism in the tail and were cut at the forward end of the empennage during recovery. The ruddervator trim cables exhibited a splayed appearance consistent with tension overload. Continuity of the cables from the empennage to the rear spar could not be established because the cables were cut and removed during recovery. The inboard portion of the right wing was deformed upward and there was diagonal wrinkling of the upper and lower wing skins. All 4 wing attach tension bolts were intact and installed through portions of the bathtub fittings. The fractures at the right wing separation point all exhibited a dull, grainy appearance consistent with overload. The left wing was located with the main wreckage and was partially attached to the fuselage. The right stabilizer was found about 890 ft northwest of the main wreckage. The right stabilizer and ruddervator were mostly intact with little damage. The right stabilizer spars were fractured through the outboard attach bolt holes with upward deformation on the upper portions of the spars. The right upper stabilizer skin had a cable tear, and there was upward deformation of the leading edge cuff on the fuselage. The inboard half of the left ruddervator, located about 1,695 ft north-northeast from the main wreckage, was separated and recovered in several pieces. The left stabilizer was found about 1,430 feet north of the main wreckage. He left stabilizer had an area of impact damage with missing paint, metal transfer, red paint transfer, scraping and scoring. The left stabilizer forward spar had no obvious deformation, but the rear spar was buckled and deformed aft. There was a cable tear in the root rib in a forward direction and the leading edge cuff was undamaged. The engine case was fractured, exposing the internal mechanisms of the engine. The crankcase was impact-damaged, and much of the crankcase structure was not recovered. Several pieces of the left and right crankcase halves remained attached to individual cylinder bases at the cylinder attach points. The crankshaft was bent to the right just forward of the main bearing saddle No. 3. The crankshaft was bent to the left at cylinder No. 5 rod attach point due to impact forces. The accessory case located on the rear of the engine case was not located. The camshaft gear, starter gear and magneto gears were exposed. The right and left magnetos separated from the engine, but were recovered. It was not possible to identify the orientation of each magneto prior to separation. The magnetos would not rotate manually, so a teardown was performed. All internal components were accounted for. The plastic timing gears were intact, as were coils and point sets. The left exhaust collector was heavily impact damaged and remained attached to cylinder Nos. 2 and 4 at the cylinder exhaust ports. The collector from cylinder No. 6 separated. The right exhaust collector separated but was recovered. The collector received heavy impact damage. The exhaust muffler separated from the right exhaust collector and received crushing impact damage. The muffler remained open on both ends and no flame cone was present. The muffler cover was removed and inspected. No cracking or visible leakage was noted between the muffler and cover. Both propeller blades separated during the accident sequence. There was no obvious damage to the leading edges or blade faces. The retention nuts and counterweights remained installed on the blades. There was similar damage to the retention nut and hub threads on both sides, including fractured threads, smeared threads, and flattened areas. Two aluminum medical-grade oxygen bottles were found in the wreckage, each with a capacity of 24 cubic feet at 2015 psi. The bottles were removed and the valves on both bottles were found closed. The pressure on one bottle was 600 psi and the other was 1,200 psi. A more detailed description of the wreckage is available in the Airworthiness Group Factual Report in the public docket. 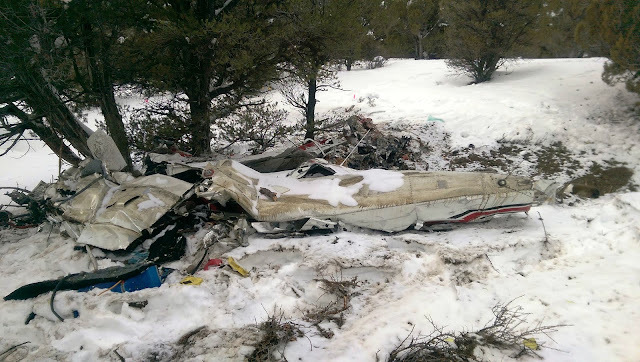 Pathology Group, P.C., Grand Junction, Colorado, performed an autopsy of the pilot. The cause of death was multiple blunt force injuries. A focal area of 50% stenosis was found in the mid-left anterior descending coronary artery, but the remainder of the examination of the heart and other organs did not identify any natural disease. The FAA's Bioaeronautical Sciences Research Laboratory, Oklahoma City, Oklahoma, performed toxicology testing on specimens of the pilot. The testing identified diazepam and its active metabolite nordiazepam; hydrocodone and its active metabolite dihydrocodeine; norcyclobenzaprine; and zolpidem in liver and kidney. No blood or urine specimens were available for testing. Diazepam, hydrocodone, cyclobenzaprine, and zolpidem are all potentially impairing medications, and each carried performance warnings about their use, particularly in combination. Aeronautical Information Manual, Chapter 8-1-2, "Effects of Altitude:"
1. Hypoxia is a state of oxygen deficiency in the body sufficient to impair functions of the brain and other organs. Hypoxia from exposure to altitude is due only to the reduced barometric pressures encountered at altitude, for the concentration of oxygen in the atmosphere remains about 21 percent from the ground out to space. 2. Although a deterioration in night vision occurs at a cabin pressure altitude as low as 5,000 ft, other significant effects of altitude hypoxia usually do not occur in the normal healthy pilot below 12,000 ft. From 12,000 to 15,000 ft of altitude, judgment, memory, alertness, coordination and ability to make calculations are impaired, and headache, drowsiness, dizziness and either a sense of well-being (euphoria) or belligerence occur. The effects appear following increasingly shorter periods of exposure to increasing altitude. In fact, pilot performance can seriously deteriorate within 15 minutes at 15,000 ft.
3. At cabin pressure altitudes above 15,000 ft, the periphery of the visual field grays out to a point where only central vision remains (tunnel vision). A blue coloration (cyanosis) of the fingernails and lips develops. The ability to take corrective and protective action is lost in 20 to 30 minutes at 18,000 ft and 5 to 12 minutes at 20,000 ft, followed soon thereafter by unconsciousness. 4. The altitude at which significant effects of hypoxia occur can be lowered by a number of factors. Carbon monoxide inhaled in smoking or from exhaust fumes, lowered hemoglobin (anemia), and certain medications can reduce the oxygen-carrying capacity of the blood to the degree that the amount of oxygen provided to body tissues will already be equivalent to the oxygen provided to the tissues when exposed to a cabin pressure altitude of several thousand feet. Small amounts of alcohol and low doses of certain drugs, such as antihistamines, tranquilizers, sedatives and analgesics can, through their depressant action, render the brain much more susceptible to hypoxia. Extreme heat and cold, fever, and anxiety increase the body's demand for oxygen, and hence its susceptibility to hypoxia. 5. The effects of hypoxia are usually quite difficult to recognize, especially when they occur gradually. 6. Hypoxia is prevented by heeding factors that reduce tolerance to altitude, by enriching the inspired air with oxygen from an appropriate oxygen system, and by maintaining a comfortable, safe cabin pressure altitude. For optimum protection, pilots are encouraged to use supplemental oxygen above 10,000 ft during the day, and above 5,000 ft at night. The CFRs require that at the minimum, flight crew be provided with and use supplemental oxygen after 30 minutes of exposure to cabin pressure altitudes between 12,500 and 14,000 ft and immediately on exposure to cabin pressure altitudes above 14,000 ft. Every occupant of the aircraft must be provided with supplemental oxygen at cabin pressure altitudes above 15,000 ft.
On January 14, 2016 about 1745 central standard time (CST), a Beechcraft C-35, N2025D, was destroyed when it impacted terrain near Meeker, Colorado. The airplane departed from Provo Municipal Airport (KPVU), Provo, Utah, enroute to Granby-Grand County Airport (KGNB), Granby, Colorado. The private pilot, the sole occupant, was fatally injured. Visual meteorological conditions prevailed for the personal flight that was conducted under the provisions of 14 Code of Federal Regulations Part 91. No instrument flight plan had been filed. According to preliminary information provided by the Federal Aviation Administration, while enroute during the accident flight, the pilot requested flight following from air traffic and requested clearance to fly a higher altitude to stay clear of clouds. After receiving flight following, air traffic control queried the pilot on his change of route and altitude before noticing the airplane descend and losing radar and radio contact. 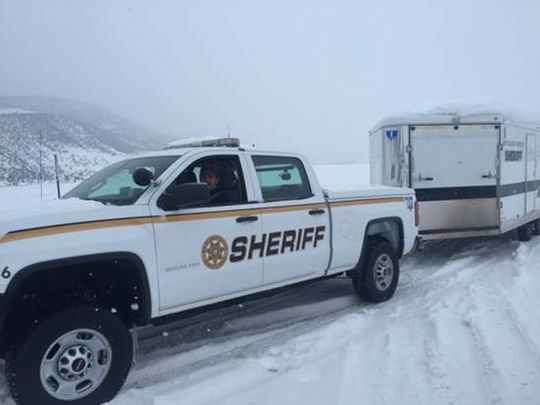 A search and rescue effort was activated and the airplane was found early the following morning in mountainous terrain. 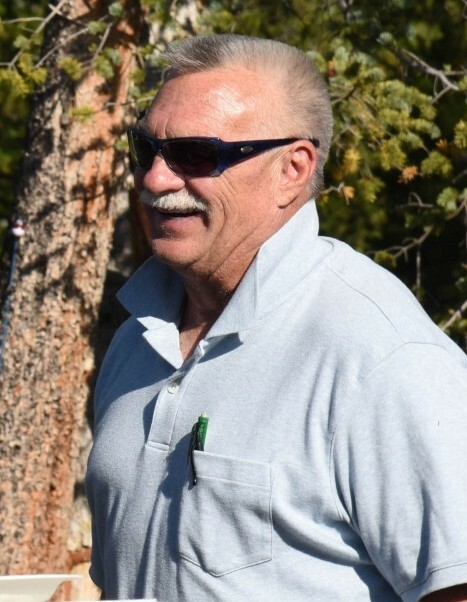 Nov 1, 2018 - After an approximate 90-minute deliberation, jurors acquitted William R. Hiler, of Tabernash, Colo., on felony charges of marijuana with intent to . got us a real winner here; glad he killed himself and not a plane full of innocents. Hate to see anyone killed in aviation, but this guy had a habit of making bad choices. Stupid is as stupid does. Sad this idiot had to destroy a perfectly good airplane.